Riding for 10 hours today. It’s a good way to be sore ALL OVER. Tomorrow has the potential to be a short day or another LONG day… so I may pass. Riding for another 10 wouldn’t be so bad, it would be coming home and having to cook and prepare for branding that would do me in. because sleep is more on my mind, than anything else. I love that last photo! That is beautiful country and a beautiful photo. You are a lucky lady! Stunning backdrop, Carol. Thanks for sharing your adventure and all that you experience on a daily day ranching. Please take as many Advil as necessary to keep posting pictures like the one above. Yes! It was a glorious day! Thanks for finally commenting! Oh, yes, Advil helps! Those are the Big Horn Mountains… You’re looking at 4600′ to 10,000′ or so… just roughly. Glad you are up and about. Hope the Advil works for you. Great photo. Still amazes me that there is RED in WY. Not sure what I expected though. Blame it on The Virginian, Lawman, and all those other TV Cowboy shows that I grew up on – and in black and white. Guess that’s the problem!!!!! Does it get any better than this? 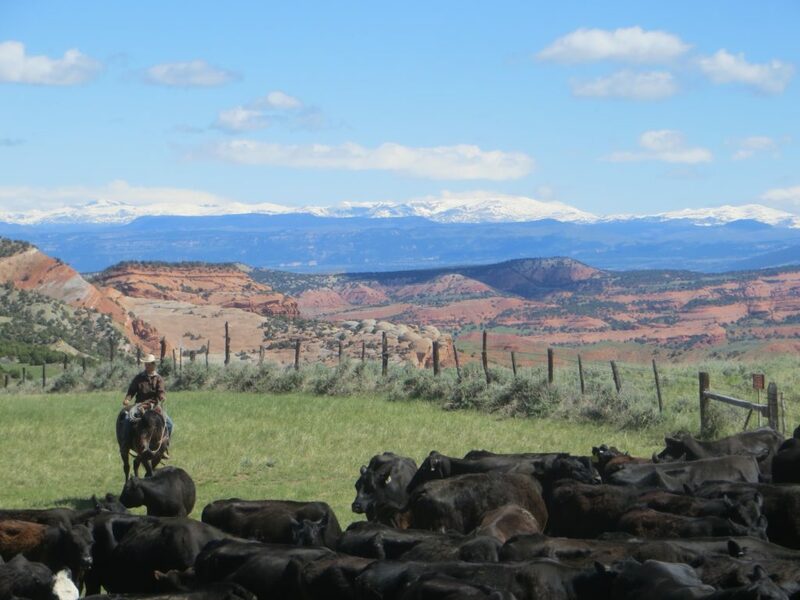 Blue skies, purple mountain majesties, red hills, green grass, black cows, and a cowboy. I envy you the day….though not the aches.